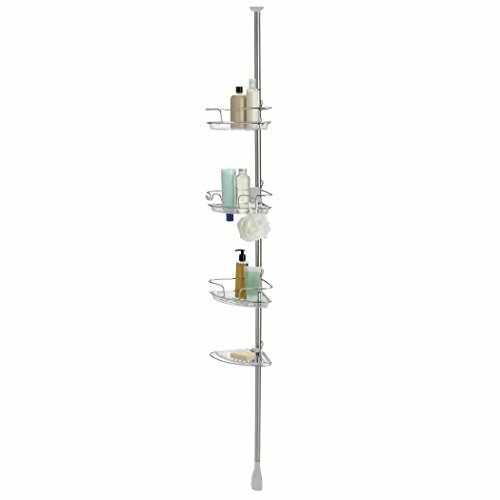 Organize everything in the shower with the OXO Good Grips Lift & Lock Pole Caddy. Simply screw the poles together and use the Lift & Lock ratcheting mechanism to quickly and easily install the Pole Caddy without any tools. The Caddy comes with one shelf and three bins that hook around the pole and lock into place with a light and easy push. The bins and shelf can be mounted and adjusted without removing the pole. The bins are generously sized, with holes for holding shampoo bottles upside down and hooks for hanging loofahs, brushes and poofs. 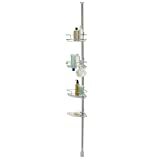 The shelf is great for storing soap and razors and features a bar for hanging washcloths. At OXO, we consistently develop products that address even the tiniest of pet peeves, because we know it’s the little things that make the biggest difference. OXO employees, many of whom hit the gym prior to coming to work, secretly hoped for showers during a recent office renovation. Our super-savvy Cleaning & Organization team convinced OXO’s president to install showers because of the need for testing the expanding line of Bath Storage products. A win-win! Assign a shelf to each member of the family or household and adjust it so it’s just their height to keep everyone happy (and clean!). OXO is dedicated to providing innovative consumer products that make everyday living easier. We study people – lefties and righties, male and female, young and old – interacting with products and identify ways to make them better. Our “question everything” process and relentless attention to detail uncover the best solutions for slicing, peeling, whisking, baking, stirring, washing, scrubbing, dusting, storing and organizing.